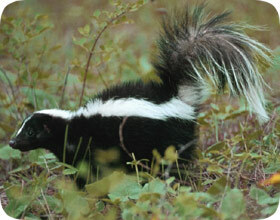 About Skunks: Everyone knows the black and white skunk and its smelly spray. Skunks commonly live under GA sheds and decks. They cause a big problem with their odor. They also commonly dig holes throughout a yard in their search for grubs. Skunk are a common nuisance animal in southeast Georgia. In Atlanta and Fulton County, skunk have become a particularly common problem, as they have invaded many homes in the area. If you need a professional solution for your Atlanta skunk problem, give us at A Wildlife Pro a call. We are experts at skunk control and removal, and have been working with Georgia wildlife for over 10 years. We are familiar with the habits of Georgia skunks, and are experts at humane trapping and removal of this critter. Give us a phone call any time, and we can schedule a same-day or next day appointment. Atlanta Wildlife Pest Control Home Page - Learn about all of our services, and more about our animal control company. We cover a wide service range and remove wildlife in all of the greater Atlanta, GA metropolitan area, including the towns of Marietta, Sandy Springs, Roswell, Alpharetta, Suwanee, Duluth, Decatur Norcross, Auburn, Winder, Lawrenceville, Tucker, Mountain Park, Stone Mountain, Panthersville, East Point, Mableton, Smyrna, and more. We service Fulton County, Gwinnett County, DeKalb County, Colb County, and Cherokee County. If in doubt about our service range or any of the types of services we offer, just give us a call, and we will let you know if we service your area and/or your wildlife problem. We look forward to hearing from you!